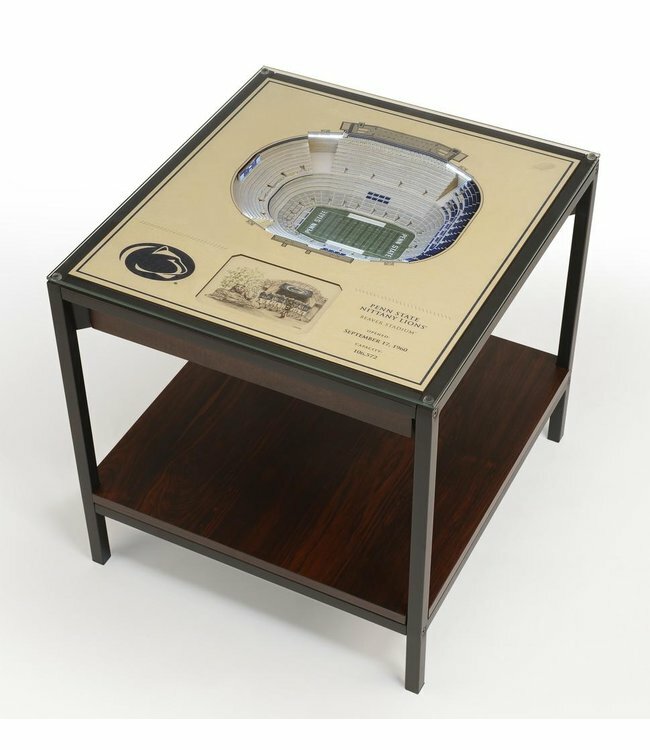 The 25-Layer StadiumViews Lighted End Table makes a glowing addition to your den, game room or fan cave. The 25-Layer StadiumViews Lighted End Table makes a glowing addition to your den, game room or fan cave. We take twenty-five layers of composite wood assembled to create a three-dimensional work of stadium art. Then we add LED lights that specifically match the actual lighting of the stadium. The entire piece is suspended in a black, powder-coated, heavy-duty metal frame, topped with a 1/8" thick piece of tempered glass, and finished with a wood laminate lower shelf. It all comes together, out of the package, with just eight screws. Size/WeightW 22" / D 22" / H 24" / 50 lb.